The great thing about street ballers as opposed to NBA players is that the former are about three times more likely to entertain you. 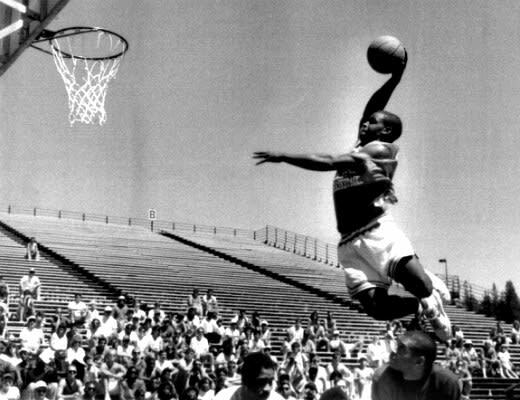 Demetrius "Hook" Mitchell was one of the best at doing that. Despite his 5-foot-9 frame, Hook wasn't just a little dude who used crazy ball handling skills as his go-to weapon. The Oakland native was the type to drive down the lane and dunk over opponents that stood nearly a foot taller than him. Way before 6-foot-10 Blake Griffin jumped over a car to take home the 2011 Dunk Contest trophy, Hook was doing the same except with he added a 360 for style points. NBA players like Gary Payton, Jason Kidd, Antonio Davis, Drew Gooden, and Brian Shaw played with Hook and said he's one of the most talented players they'd ever seen. Sadly, Hook never got to take his talents to the league as he got caught up in drugs and crime. This soundtrack never seemed more appropriate.